Cafe Habibi, in Westlands, opposite Soin Arcade, is a lovely place to chill out on a Friday evening after work. It has a very Arab theme to it, low chairs, and decor is some variation of Moroccan. They have some of the best milkshakes and sheesha in Nairobi. They do not serve alcohol, perfect for the lent period! So last Friday, we decided to try it out… We got there, the place was a little crowded, but hey-ho it was Friday. The menu looked pretty good, but the prices were a little too pricey for that kind of establishment. But hey-ho against better judgement we ordered. I should have smelt a rat when the waitress had no idea what I was ordering! We had to resort to a point-at-the-menu tactic for her to understand. For starter we ordered Calamari. 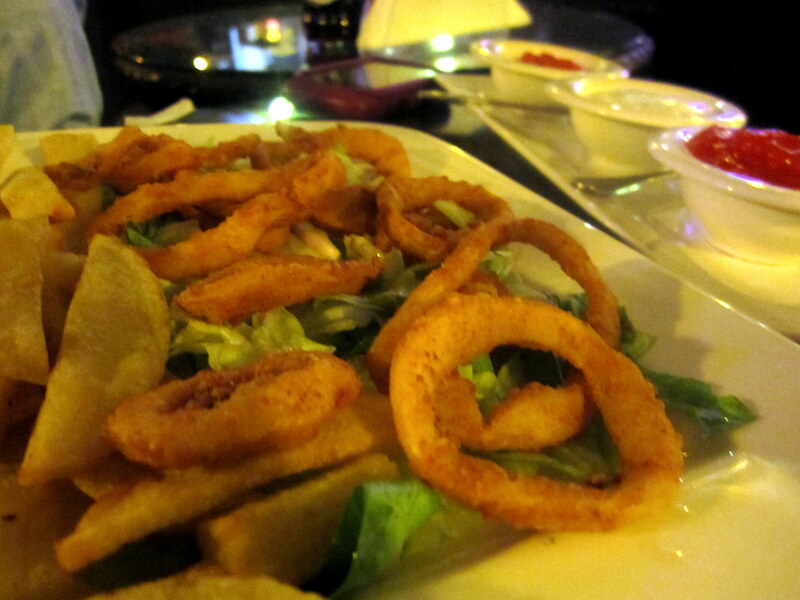 How does one go wrong with calamari? And since when does it come with chips? I certainly didn’t order any chips! I had a niggle about the portion size, to which the waitress replied ‘that is the way they come’ I said send it back, and she added 4 more pieces of calamari. Did I mention the price? 995/- (that’s about $12) for all 7 pieces. The price and the small portion didn’t mask the fact that the calamari tasted like burnt rubber. Next was the main course; I had the fish tikka. What should have been a nicely grilled fillet of fish, was really an over cooked, very dry piece of fish with not even an ounce of tikka or any seasoning for that matter. It was served on flatbread, which was just as dry as the fish. The chef thought it best to serve chips, even though I asked for a salad, and only got a tiny salad in the corner. Babu ordered the mixed grill. 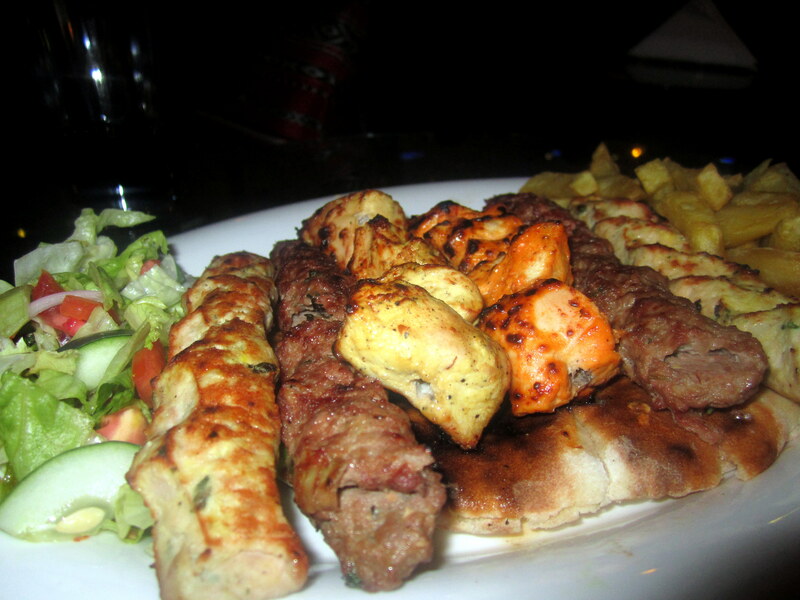 In my mind, the mixed grill should have been good, I had images of Masrawy’s mixed grill. When it arrived, it looked good, but then we were hit by a terrible stench coming from the meat. I can’t quite explain it, it just smelled off; like meat that had been sitting days too long! It was terrible. The poor waitress, had no idea what she was doing or saying, and it was clear that the manager was aware of our issues, but chose to stay away from our table until I called for him to come over. I explained to him about the food, and he promised to check with the chef… Only for him to come back and say that we are wrong; the meat is fresh and the fish… his response made me laugh he said “fish is meant to be cooked for a very long time to ensure that it is not raw in the middle, that is the way we serve it” GHAI! since when is fish cooked to the point of burnt for it to be deemed cooked? Anyway, the manager refused to discount the bill and offered us pastries the next time we come in, which I think will be NEVER!! What really got me more than the BAD food, was the attitude the manager had… He irked me the wrong way! Even now, thinking about it, I still want to knock him over the head with his pastries!! What happened to the customer being right? and if you offer bad food in a restaurant, shouldn’t you then make a point, as a manager, to rectify this with the customer, at least so they might come back or so they don’t write a bad review! 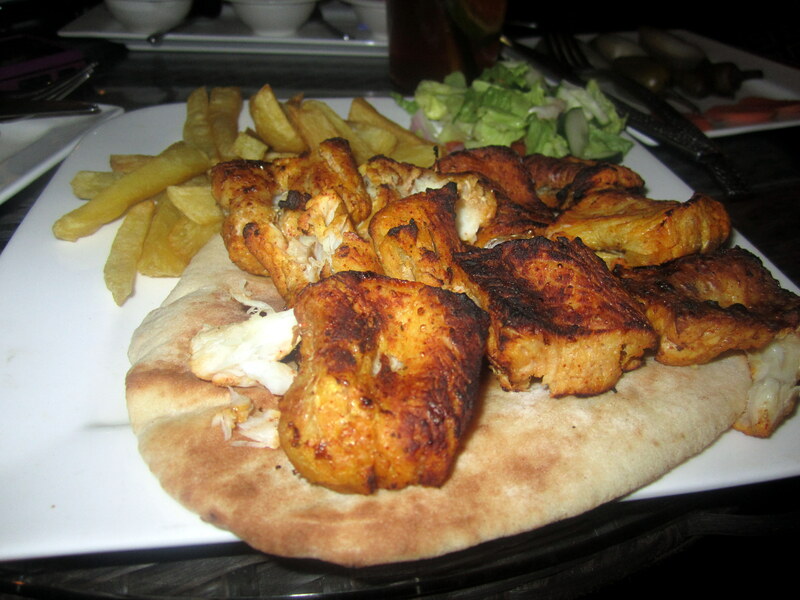 So folks, I think if you are going to Cafe Habibi, DO NOT EAT THE FOOD!! Smoke the sheesha, drink a milkshake, but don’t go anywhere near the food.